In a nutshell, a meal plan is a planning tool that helps you answer the “what’s for dinner?” question only once per week. With a meal plan at hand, you are not wrecking your brain over what to eat for breakfast, lunch and dinner. It also saves you the hassle of having to run to the store midweek to pick up a key ingredient for a recipe you’ve just found on the internet. I believe that our health comes from proper nutrition. We can’t always supplement our way out of a disease. Our diet is one of the best health promoting tools that we have available. I also believe that diet should be individualized. One size does not fit all, especially when it comes to your health. For example: are you working on losing some extra pounds, want to eliminate bloating, have more energy, improve sleep or address food sensitivities? You may simply want to feel better. Depending on what you goals are your dietary choices will vary. For example you may want to focus on anti-inflammatory foods to help you manage acute and chronic pain. Or perhaps a high-protein-low-sugar diet to help you achieve a healthier body composition. If you are a vegan or a vegetarian, planning out your macros and micros may be challenging. A customized meal plan takes that thinking out of the equation as it can be optimized to meet nutritional requirements. Another advantage of having a customized meal plan is that it takes your schedule into consideration. Have a busy week coming up? All meals for the week can be prepared on a weekend, packed and ready to go. Having leftovers for 2-3 days can also save you from having to cook every night. Crock pot recipes are big time savers. Just pop in some vegetables, protein and healthy carbs into a slow cooker set it and forget it. Meal plans can also save you money. By shopping with a grocery list, you are only buying what you need. No more throwing out rotten vegetable that no one used at the end of the month. 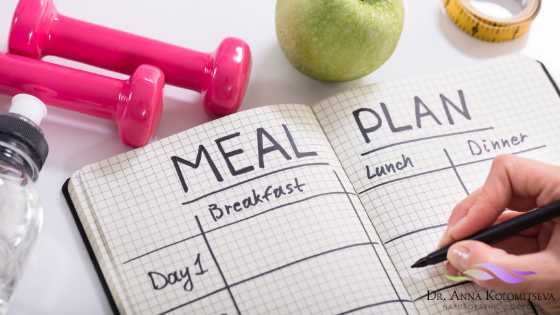 Having a customized meal plan that seamlessly works with your lifestyle is a smart strategy to optimize your health. Want to try out a meal plan that will save you time? CLICK HERE to receive you free 3-day meal plan! Let me know in the comments section which was your favourite.